Among the blue ribbon winners at the recently-concluded Los Angeles County Fair were a pair of works of art that conveyed as much love as artistic skill. Virginia Ishida won first place for a gingerbread and candy house in the edible art category, a piece dedicated to her dog, Mei Mei. Her tall Monterey Park condo is sparsely decorated, but a few of her more prized works are prominently displayed. 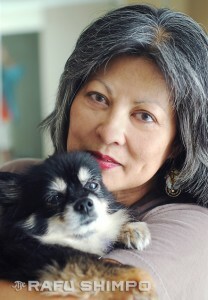 Virginia Ishida and Mei Mei. 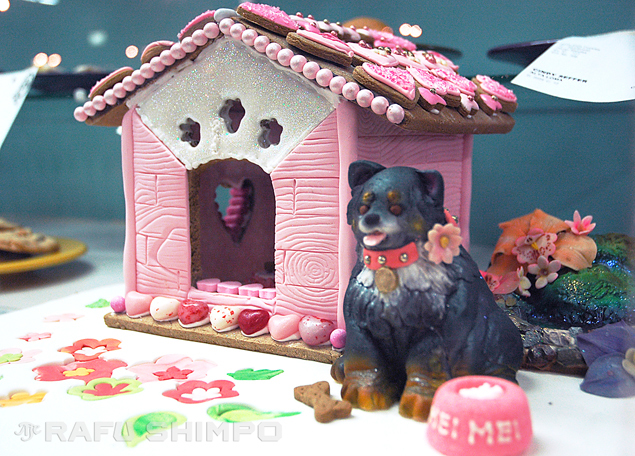 “Forever Home” featured a depiction of Mei Mei, a former shelter dog, next to a fanciful pink house. The figurine was sculpted of fondant over a rice krispy treat, shaped and airbrushed. An article in the El Segundo Herald pet section about Mei Mei’s adoption was on display next to Ishida’s entry at the fair. Ishida, a Pasadena native who graduated from John Muir High School, recently retired from her job as a court reporter, and now has plenty of time to pursue artistic projects. She has a drawer crammed full of blue ribbons and other awards, with the first county fair prize coming two years ago. 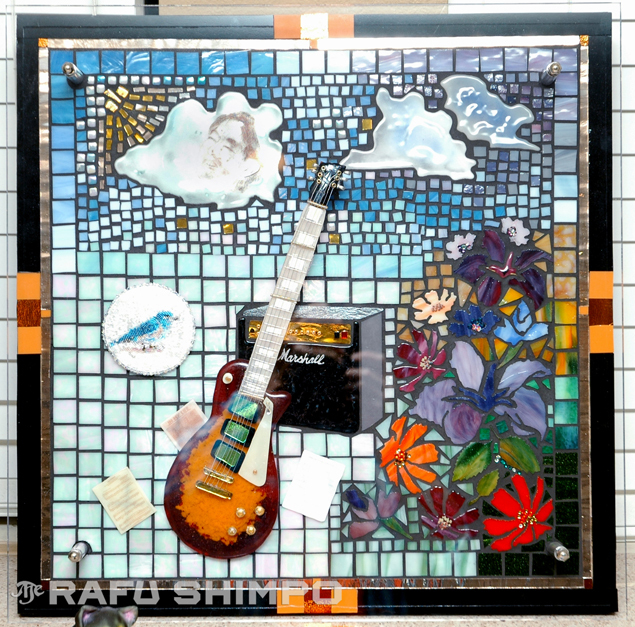 Ishida’s tribute to her brother, Roy, features his Gibson guitar, Beatles sheet music and bead work of a blue jay he used to feed at this house. 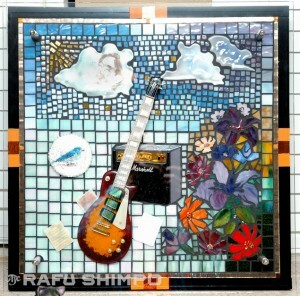 This year, Ishida also won top prize for a mirror-and-stone mosaic she created. it was an emotion-filled project, dedicated to the memory of her late brother, Roy. “The fair was coming up and I wasn’t going to do anything [for Roy], but something came over me and I wanted to dedicate something to him,” she explained. The work features Roy’s beloved Gibson guitar, Beatles sheet music and bead work of a blue jay he used to feed at this house.